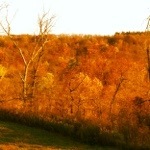 Yesterday’s run was beautiful. My neighbor is training for a half marathon so, I join her on her runs. 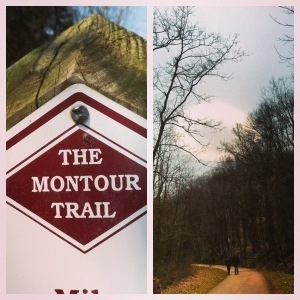 We hit the Montour Trail and there we were met by one lone cloud in the sky, perfectly shaped and, just amazing. 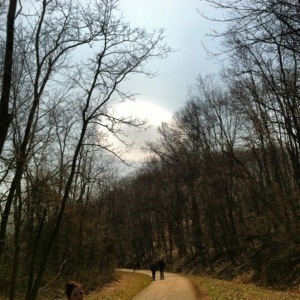 Our six mile run was good and, more clouds joined that one. Of course, it’s Pittsburgh and rarely is there a cloudless day! That’s ok, the clouds are beautiful. The Sun came out Again!! 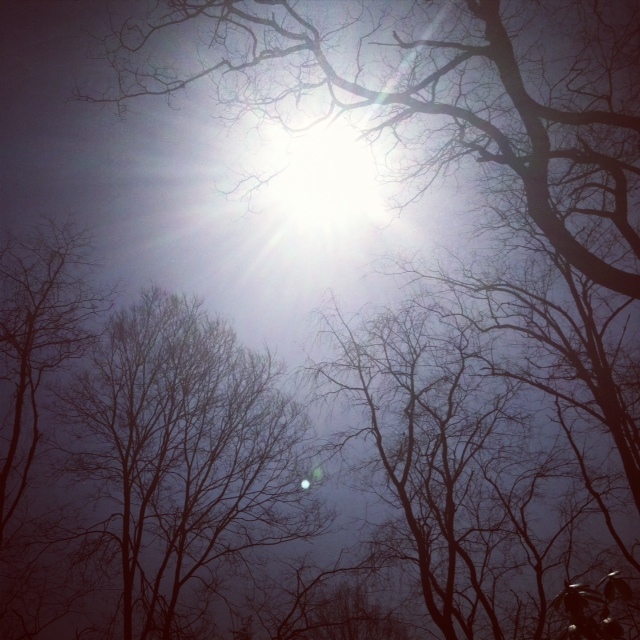 The last time I saw a beautiful sunny day I wrote about it and, I said I’d let you know how the next day turned out. The sun did stay out that ENTIRE DAY! The next day it was cloudy with snow flurries, which stayed around for the next couple of days. YES, snow flurries! Just today my neighbor told me she heard a guy say something funny. He said, “What a nice Winter we are having this Spring” EXACTLY!!! The sun has come out again for a couple of more days and I think JUST MAYBE Winter will lie down and let Spring come here in Pittsburgh. Pittsburgh is a gorgeous old city and on a sunny day it really is fun to get out, which we did the other day. One of things I LOVE about the city are all of the beautiful old bridges. 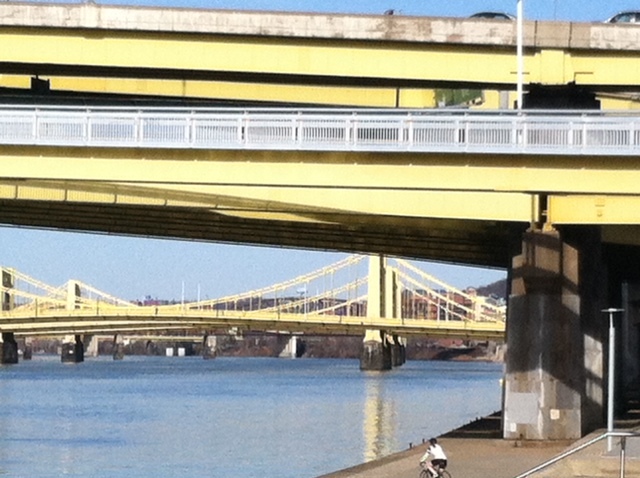 Pittsburgh is known for its bridges, which I have to admit I did not know prior to moving here (**GASP**). Hey, I am a native Californian and, well, I won’t say anything further to incriminate myself or any other Californian in regards to our sense of the continental United States geography. It is beautiful to see these old, steel bridges throughout the entire city. I also found a good place to run, Point State Park. 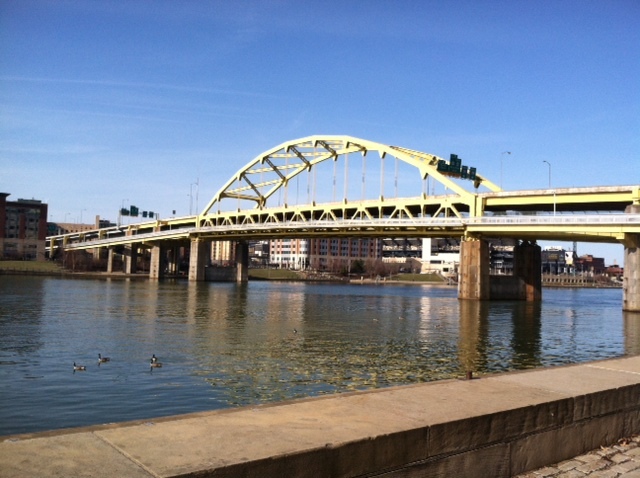 The park is located at the “tip” of the triangle in Pittsburgh, where all three rivers meet. The view of the rivers, bridges, and stadiums is nice and there are plenty of places to sit and enjoy a beautiful day. The day we visited there were lots of folks out riding bikes, jogging, sitting around talking and just out having a good time. I’ll be sure to get out there and go for that run, WHENEVER Winter decides to let go and allow Spring to finally come. I woke up this morning listening to the birds sing. I sat up in my bed thinking maybe, JUST maybe the sun is shining. Sure enough it is!!! I took a picture to capture this monumental moment. Hope it is sunny wherever you are. If so let me know! Supposedly spring is here. The vernal equinox was on March 2oth. Someone forgot to tell Mother nature to check that off of her to do list because, the weather is no better here in Pittsburgh, Pennsylvania than it was last month. This past weekend I took son#3 to an Easter Egg hunt. He HAD to wear gloves, a jacket and mittens. Why? BECAUSE IT WAS COLD! Not Los Angeles, CA cold BUT, Pittsburgh, PA cold! I HAVE NEVER thought of snow in Spring (unless you drive to it, far away, to snowboard). It amazes me that it is still below 30 degrees. The sun and I have a whole new relationship now. I am like a cat. Whenever the sun-rays come out I am ALL IN! I run to the window, snuggle up on the floor right in the one sun-ray that beams into the window for the few minutes of sun that will come in. I say few minutes because it is never a full day of sunlight. I purchased Vitamin D and now take it because I could possibly develop rickets here from lack of sunlight. Are you laughing? I’m serious! As I sit here typing this it is 21 degrees outside and now the sun has been enveloped by clouds. Ho hum! Spring is coming! Oh wait, it’s already here! This morning I was filling out an online form and was prompted to write in my zip code. At that moment it hit me that, right now, I technically have no official zip code. No home, I’m in limbo. On our journey from Georgia to Pittsburgh we are in between homes. I am neither a 30044 or a 15241 resident just yet. Our home sold and closed on 10/18 and we are SUPPOSE to close on 10/19 here in PA; yet today I am a non-resident either state. All of our belongings are packed on a moving truck and left yesterday. It really brings to mind that material objects, even a house aren’t what makes a family. My family is here, content, laughing and full of life, while just being together in a car, with a weeks worth of clothes (an electronics, we’re not that content yet). Maybe when I sit in my new home, in the cold I can remember this. Just being together and being content as a family. Enjoy your fam today too! What do you do when you are overwhelmed? I mean so overwhelmed you don’t know which way is up? This is where I am right now. When I get like this I escape to the couch, with a snack, a laptop and a nap. Escaping is fun. Having fun activities makes me happy. Happy is my cup of tea. A good cup of tea is a good way to escape too; that’s fun. However, my fun often comes at the expense of me doing what I am “suppose” to do. Many people don’t know this about me; I am the Mom, the SAHM, the one always on top of things…NOT ALWAYS! Those close to me (hi hubby) often find me frustrating. You see, I am pretty laid back (at times & with certain things) and that translates into procrastination Now, I almost NEVER do so in a time crunch or when others are relying on me. But, give me some time and I will and do the “P” word. SO, as I sit here typing my blog. I am aware of all the things I HAVE to do to prepare for my move to Pittsburgh, PA. BUT, guess what? I have not put off writing my blog!! I am NOT procrastinating now! I am also having a cup of tea! FUN AND NOT PROCRASTINATING! I am on it (did I mention ALL of the other stuff I have to do, pack, make calls, clean attic…never mind). You see if you procrastinate in one area, you are not in another (good rationale), even if it is in a fun area. It all balances out! So, what areas are you NOT procrastinating in?